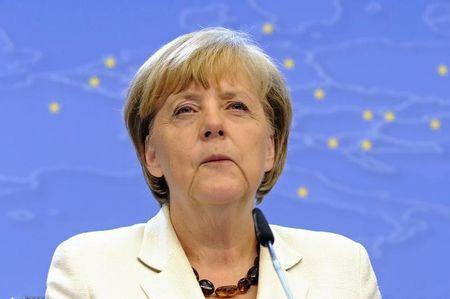 BERLIN (Reuters) - Germany's Angela Merkel said on Tuesday there were no plans at present for further economic sanctions on Russia over Ukraine but she was unhappy that a ceasefire agreement was being broken and that pro-Russian rebels had gone ahead with their elections. "We are not satisfied with the situation of the Minsk agreement because large parts of the Minsk agreement are not being implemented," she said, adding that the ceasefire and respect for Ukraine's borders were both being flouted. The chancellor said she would speak to Ukraine's President Petro Poroshenko and Russia's Vladimir Putin and reiterated her intention to have European Union travel bans extended to newly-elected separatist officials in eastern Ukraine. "Beyond that, further economic sanctions are not planned at the moment, we are focusing on the winter and the humanitarian situation there and how to get a real ceasefire," she said.